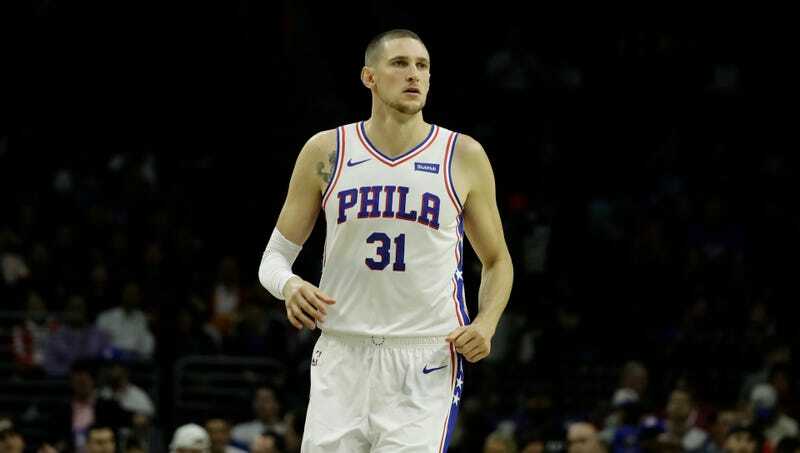 Sixers Apologize For Mike Muscala's Dad's Tweets About "African American Mental Illness"
As first reported by PhillyVoice reporter Kyle Neubeck, the Philadelphia 76ers issued an apology on Saturday afternoon for some gross tweets made by Mike Muscala’s father Bob. The elder Muscala has apparently operated the anonymous account @MuskieBobber for years alongside his professional account, @ChemicalHealth, which he has his real name on. Neubeck and ESPN confirmed that MuskieBobber was Bob. MuskieBobber was tagged when Bob appeared on a Sixers podcast this summer, and the account also tweeted several photos from the Sixers preseason trip to China this month. Additionally, MuskieBobber has manually retweeted ChemicalHealth and stayed in character as Bob, which probably means Bob forgot which account he was on. Bob and Mike are from Minnesota, and it seems that Bob is a Timberwolves fan who is not happy with the huge mess that the team is currently wading through. Specifically, he’s called out Jimmy Butler in some pretty fucked up ways. Maybe everyone associated with the Sixers should stay off Twitter at all costs. What Are The Last Two Numbers Of Bryan Colangelo’s Cell Phone?